NORTH MIDDLETON TOWNSHIP, Pa.—Whether he was taking advantage of a loading dock mistake or had someone helping on the inside, police here say a trucker from New Jersey drove away with 144 Xbox 360s and then sold them off. He was extradited this week after he was arrested trying to flee the country. Jean W. Samedi, 35, of Irvington, N.J., is now in custody in North Middleton Township, which is north of Carlisle, Pa. Chief Douglas Reitz of the North Middleton police said the heist occurred back on July 8. The heist, in the whole number of consoles, surpasses the one we reported Nov. 19, in which a man in Memphis was charged with stealing 58 Xbox Ones. That job was valued at $58,000, well above the unit's $499 MSRP. The 144 Xbox 360s in this case were valued collectively at $32,000. Samedi, Reitz said, pulled up to a distributor's warehouse to unload his shipment. A pallet of Xbox 360s was left in his trailer, and Samedi drove off with them. Police believe he did so knowingly. 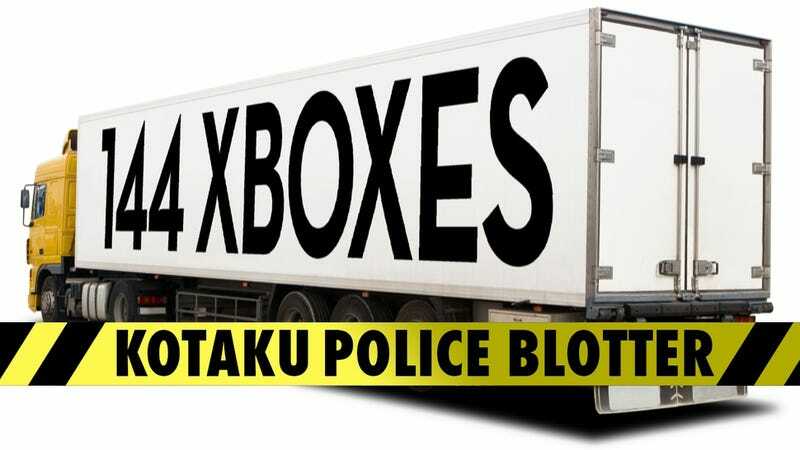 "We have security camera video of him going back, looking in the truck and everything, then getting in the truck and driving away with it," Reitz told Kotaku. Reitz's department marked the MAC addresses of the stolen units and waited for them to come online. Sure enough, dozens of them did, mostly in New Jersey but elsewhere in the mid-Atlantic region, too. Samedi went into hiding and a warrant was put out for his arrest Nov. 3. On Jan. 9, Reitz said, Port Authority police in New York arrested Samedi at John F. Kennedy International Airport. Reitz believed Samedi was trying to flee the country though he wasn't sure of his destination. On Friday, Samedi was extradited from Queens back to North Middleton Township. "The person we arrested is giving us additional information," Reitz said. "We don't know if he was conspiring [with another person] or what the situation is. He is trying to push the blame onto somebody else. "He knew what was in the truck when he left, he knew what was supposed to be unloaded," Reitz said. 'He may have had somebody on the inside helping him, saying, hey, let's get rid of this stuff. We don't know for sure. He's working with investigators." Reitz said North Middleton Township is home to several warehouses "that deal with items like this. "But this is irregular," Reitz said. "The size of this theft is not your typical one or two game systems stolen from a store." Samedi has been charged with theft by unlawful taking, theft of property lost, mislaid or delivered by mistake, and receiving stolen property. He is in jail pending $75,000 bond with a preliminary hearing set for Feb. 3.